You may have seen snippets and screenshots of this incident circulating around over the past few weeks. Unfortunately, this is another clear example of what can happen when you post before you think. You can read more about this tale here, here, here, here and here. That is when the BBQ hit the fan, so-to-speak. Apparently Hell hath no fury like a restaurant scorned. The owner of Boners BBQ, Andrew Capron, and employees of the Atlanta BBQ joint proceeded to launch a social media assault against Stephanie for her less-than glowing review and her lack of leaving a tip (a claim Stephanie denies, stating she and her husband left two $20 bills for a just-over $30 tab, coupon included). This, of course, launched a torrent of comments, responses and news media coverage. Boners BBQ eventually did issue a pair of apologies to Stuck for their actions toward her. Yet, comments and actions on their Facebook and Twitter pages arguably calls into question the sincerity of those apologies. *You can see Facebook screenshots here, and since it is from Facebook, bottom to top is chronological order. Where do I begin? This is a total fail top to bottom with how Boners BBQ handled this situation. 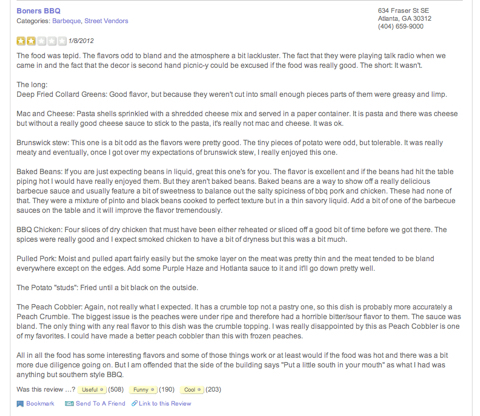 If you read Stuck’s Yelp.com review, it is well thought out, reasonable and articulate. As the customer, she is well within her rights to comment and review on a restaurant, or any business for that matter. That is one of the beauties of sites like Yelp.com and Angie’s List, it allows everyday people to either praise or criticize a business based on the service they receive, saving some from having to go through a negative service experience. The response from Boners BBQ is, quite frankly, baffling. They managed to break nearly every cardinal rule when it comes to interactions on social media. More importantly, they broke the rule ‘the customer is always right’ and the Golden Rule (treat others the way you want to be treated). Plus, the facts in their rant were incorrect. The tab was $40, but before the Scoutmob discount, it was $30+tax after the discount. Yet, if you look at some of the responses and comments from both fans of Boners BBQ and the restaurant itself, one could argue that this is an aura/attitude that the business has previously established for itself – this anti-establishment, rebel, ‘forget you’ attitude. For some, that is a draw, something fans of the Atlanta BBQ joint come to expect from their favorite restaurant. Personally, I think this is a way too narrow niche to market to, and a losing proposition in the long run. It just comes down to common sense people. You don’t curse at your customers, belittle them and insult them. That’s not just a good social media/iMedia practice, that’s just good real-world practice. Any interaction, whether on social media or not, it comes down to using your common sense. Take a moment, think before you click post or send; if something doesn’t feel right, something doesn’t sound right, something doesn’t look right, then don’t do it.